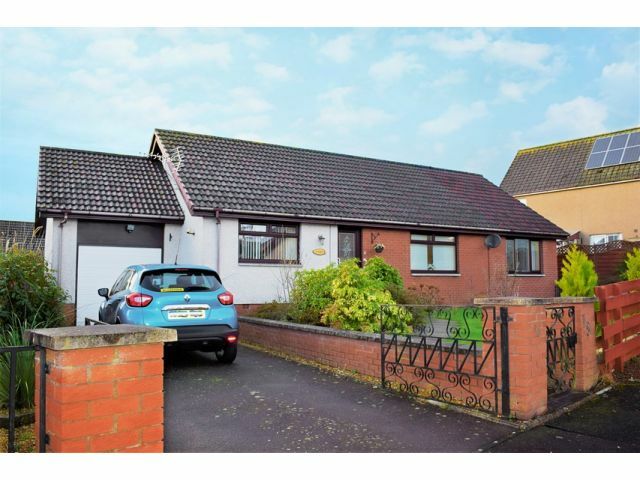 This modern three bedroom (master en suite) bungalow is situated in the popular Craignair Park development in the town of Annan, which has all amenities associated with a large town and is ideally located for access to the A75 & M74 North & South. Providing Lounge, Dining Kitchen and Sun Room. Master Bedroom with En Suite Bathroom, Two Further Double Bedrooms with Built in Wardrobes and Shower Room. Driveway leading to garage, large enclosed front and rear gardens with lawn and mature planting sections. Loft access. Coving, two ceiling lights, smoke alarm, telephone point. Storage cupboard with shelving. Radiator, carpeted flooring. Window to front with curtain pole and blinds. Coving, ceiling light, smoke alarm, TV point. Electric flame effect fire set on wooden surround with marble hearth. Radiator, carpeted flooring. Double glazed with blinds. Wall light. Tiled effect vinyl flooring. French doors with blinds leading to rear garden. Window to front with curtain pole and blinds. Coving, ceiling light. Radiator, laminate flooring. Window to rear with curtain pole. Loft access. Recessed lighting, extractor fan. Fully tiled. Three piece suite comprising of toilet, wash hand basin set into large vanity unit and bath with shower tap attachment. Tiled seating areas. Heated towel rail, radiator and laminate flooring. Window to rear with curtain pole and blinds. Coving, ceiling light, built in double wardrobes. Radiator, laminate flooring. Window to front with curtain pole and blinds. Coving, ceiling light, built in double wardrobes. Radiator, laminate flooring. Coving, one x four spotlights, extractor fan. Fully tiled. Toilet, wash hand basin set into vanity unit and shower cubicle with electric shower. Radiator, tiled effect vinyl flooring. Driveway leading to garage which has a door to the rear garden. Lawn to front with raised shrubbery section. Enclosed rear garden to rear with patio and lawn to rear with low maintenance sections and mature planting. Offers in the region of £161,500 are invited and should be submitted to lj Residential, 93 High Street, Annan, DG12 6DJ or by fax to: 01461 205037.